Coming Soon: A new Peace Space online. This website is currently in a time of hibernation and receiving some long-needed love, care & attention. The spammers found us! So we are re-establishing, with the hope of reconnecting with a brand new audience later this year. We hope you will come back, too, with renewed enthusiasm for engaging and accessing this Universal Wisdom work when the website is relaunched in 2019. For now, the first project receiving careful attention is the Peace Space Animal Companions book, due for publication later this year. Right now, we are proofing, editing and sprucing up all the Animal Kingdom wisdom guides. We're excited to let you know this huge body of work contains well over 100 animals and, as well as producing a printed version (likely a 2-volume set because of the sheer size), we are aiming to produce an e-book option — take a handy mobile version of the wisdom of the Animals with you wherever you go! So please check back from time to time. 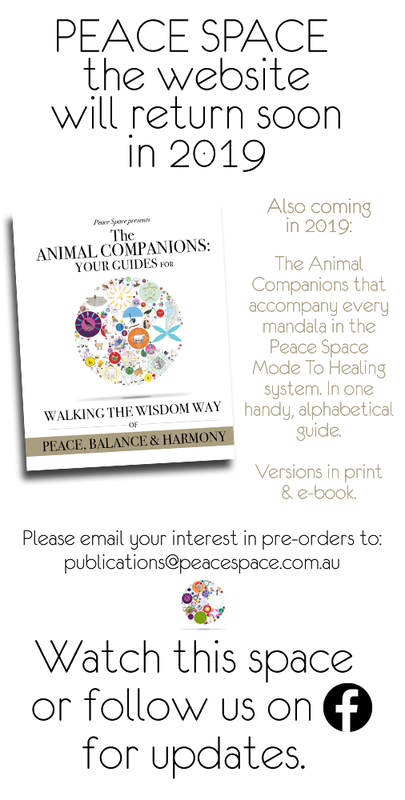 You can email your interest in keeping track of a publication date for the Peace Space Animal Companions book (see the email address on this page), PRE-ORDERS will open later in 2019. Also, as the relaunch will be announced on Facebook, why not head over and Like the page on Facebook (and choose to receive all updates - we don't post often on Facebook so you won't be inundated by regular posts in your news feed there!) if you would like to keep track of details. We thank you for your patience. All in right time.